Description: Historical and colourful map of Spain, Ibiza, Mallorca, Minorca, Portugal. Very decorative title cartouche. Condition: Close bottom and top margins, later hand colouring. 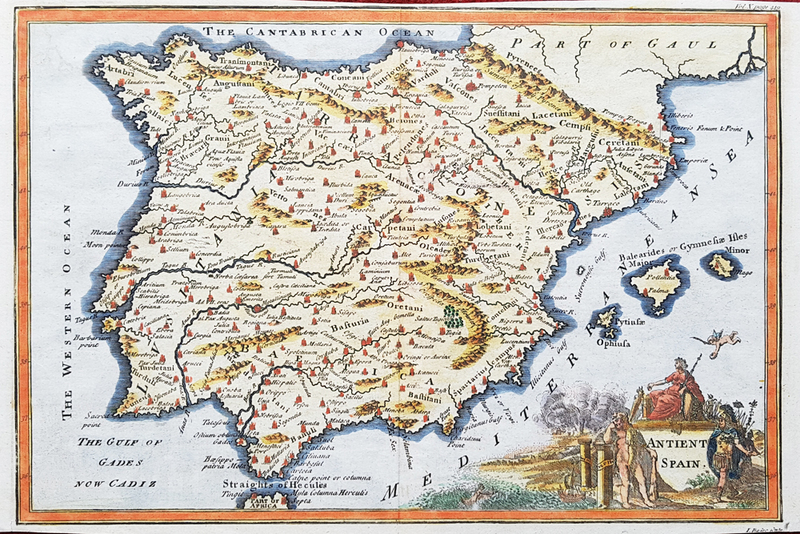 Isaac Basire 18th century map of Spain for sale. Isaac Basire (1704-68) worked as an engraver in London. His son (John) James Basire (i) (born London, 6 Oct 1730; d London, 6 Sept 1802) became known as an engraver of architecture and was employed on the first volume of James Stuart's and Nicholas Revett's The Antiquities of Athens (1762). In 1763 he travelled in Italy; around that time he succeeded George Vertue as Engraver to the Society of Antiquaries, and he became Engraver to the Royal Society in 1770. He contributed fine prints to Vetusta monumenta, produced for the Antiquaries, and other publications; he also engraved many individually issued prints, notably one after Benjamin West's Pylades and Orestes (1766), one of the first prints of a contemporary painting published by John Boydell. This was shown in London in 1770 at the Free Society of Artists exhibition; between 1761 and 1783 Basire exhibited 85 prints at these exhibitions. One, the Champ d'or, 1520, executed for the Antiquaries, was exhibited in 1775 as 'the largest plate engraved in England'. William Blake served as one of his apprentices from 1772 to 1779. Basire's eldest son, James Basire (ii) (b ?London, 12 Nov 1769; d Chigwell Wells, Essex, 13 May 1822), succeeded his father as Engraver to the Royal Society and to the Antiquaries, for whom he engraved plates of English cathedrals after John Carter; in 1819-23 he made 17 plates after the Bayeux Tapestry for them. He also engraved the annual Oxford Almanacks for the periods 1797-1809 and 1811-14. His son James Basire (iii) (1796-1869) was also a line engraver; his work includes engravings of Sussex country houses.